Publication : May 1st 2012 by William Morrow Paperbacks. In The Bag is told from the POV of four people - Daisy, her daughter Coco, Andrew and his son Webb. As it can happen with identical bags, Webb picks up Coco's bag at the Paris Airport and Coco picks Webb's, obviously by mistake. This accident leads to 4 people finding love in the most unexpected way possible. It was the cover that first attracted me to this book and after reading a sample chapter, I knew I'd like this. This was such an adorable book! On one side we have Webb and Coco with their witty and totally charming e-mail exchange(s) that had me laughing the entire time I was reading the book. On the other side there's Andrew and Daisy's really sweet story of two adults still looking for love. All four characters play a main role in the book and it's impossible not to root for them! I did some googling and found out that this is Klise's first adult book and I have to say that she's certainly good at creating/writing about teenage characters because Webb and Coco kept me amused throughout the novel! I'd love to see Klise write some YA romance. 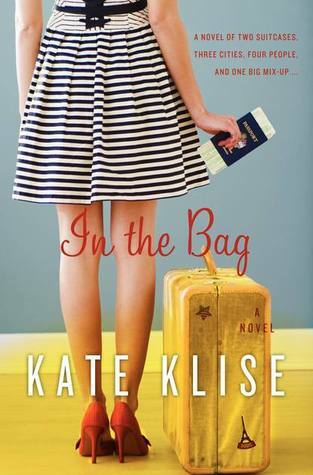 Light, funny and really cute, In The Bag is a perfect beach read. Chick Lit/Romance lovers will eat this up, especially if you're looking for a quick and happy read. I've had my eye on this one! I love the cover and the snyposis. I think I'm going to have to find it!